Chris Packham talks about Namibia's beautiful landscape and wildlife. Beautiful film exploring Namibia from the air & on the ground with Wilderness Safaris. Take a Namibia holiday; this is African travel at its most varied! Flying in, driving yourself, or being guided: the choice is yours. A classic Namibian holiday might include sunrise on top of the world's highest dunes; a day relaxing in a hot mineral spring at the foot of the world's second-deepest canyon; a wildlife safari watching lion stalk huge herds of antelope – and an evening observing wild black rhino by moonlight. Travel in Namibia is very easy – although how you travel around Namibia is at least as crucial as where you travel. There's a choice of different ways to travel around Namibia, and you should address the various options early when you're planning a holiday. Whilst styles can be 'mixed and matched', the choice boils down to driving yourself between different areas; being driven around everywhere by a guide; or being flown around. Driving yourself is by far the most popular way to visit Namibia on holiday. This isn't intrepid exploration; we'll arrange normal 2WD car hire for you (4WD is available, but is mostly unnecessary), with a full itinerary, detailed route maps, and all the information that you'll need to drive yourself around. Driving yourself is the most economical way to travel, giving you complete freedom to create your own Namibian adventure at your own pace. Distances might appear daunting, but Namibian roads are usually good, straight and empty. Driving is a joy in Namibia; it's far easier than a self-drive trip around Europe. We will advise you from first-hand knowledge and pre-arrange your trip – you simply hop into your hire car and drive away! In more remote areas, you'll often stay at small camps and lodges. From there we'll arrange for specialist naturalist guides to walk with you, or guide you around difficult 4WD terrain in their vehicles. For those with limited time, or who don't want to drive themselves, flying around Namibia can be magical – albeit not the cheapest way to visit. 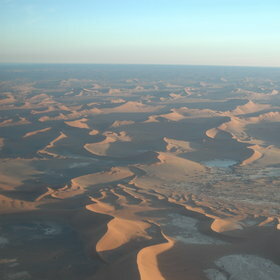 Flying over Namibia's dramatic landscapes gives you a completely different perspective. You'll marvel at the size of the great Namib Desert, fly low over seal colonies and land at grass airstrips only a few miles from your camp. If you don't want a self-drive holiday, but like the idea of travelling around Namibia by road, then you can opt to be driven around by an expert guide. The choice then is to join a small-group guided trip, or to have us organise a privately guided trip. One of Africa’s newest countries, Namibia gained its independence from South Africa as late as 1990. Formerly known as South-West Africa, the country experienced a peaceful transition from years of foreign rule, first by Germany, then – after World War I – by South Africa. Today Namibia is a constitutional democracy with an entrenched Bill of Rights that provides for freedom of speech, press, assembly, association and religion. This is particularly important given the country’s diverse population, which includes the dominant Ovambo – who traditionally live in the fertile north – as well as the Damara, Herero, Himba and Bushmen people, and a considerable number of white Namibians.